Research has shown that banner ads no longer seem to work. This might come as a surprise since banner ads have always drawn a huge amount of investment and are ubiquitous on the internet, whether you’re using a desktop or mobile device. The first banner ad was run by AT&T in 1994, and it was a hit. 44% of internet users who viewed the ad had clicked on it. Unfortunately, that was about as good as it ever got for banner ads. By 2007 internet users had become sophisticated at completely ignoring banner ads. Not just seeing them and not clicking on them, but completely blocking them out of their experience of the internet. Eye-tracking research by the Nielsen Norman Group showed that users almost never look at anything that even resembles an advert on the internet. 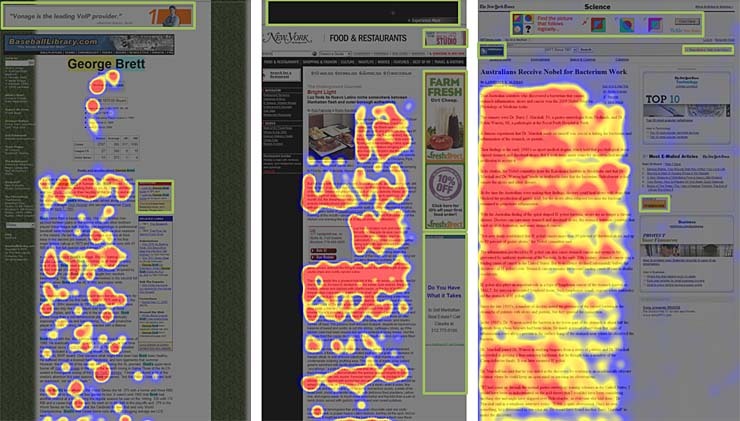 The following heatmaps show 3 examples of user engagement with online content; quick scanning, partial reading, and thorough reading. As you can see, users don’t even glance at these adverts. Even worse, they don’t look at design elements that resemble adverts. This subconscious blocking-out of banner ads is called Banner Blindness. Back in 1994, when AT&T trialled their first ad, there were only 34 million users on the internet. Today there are 3, 8 billion (Internet World Stats) users on the internet – more than half of the world’s population. There are more Google searches today then there were people on the internet back in 1994. As the number of users and the amount of content on the Internet has grown, so have the number of banner ads. In 2016, the global advertising spend for banner ads was more than US$34 billion (IronPaper). Despite this huge investment, banner ads simply aren’t performing. Let’s take a look at some global statistics to better understanding of the banner blindness phenomenon. The Internet has empowered consumers to control the kind of information they receive. You need to meet your customers where they are, and you can do this by providing relevant, interesting content. Don’t interrupt prospective customers with intrusive advertising, entice them with relevant content at the right time. Providing information that people are interested in helps you to build a relationship with them. Once you have earned people’s trust, you have a better chance of turning them into loyal customers. This modern approach to marketing is called Inbound Marketing. Inbounds core principles are permission, information, and connection. You must get permission to communicate with people, send them useful information, and make a connection with them by understanding their needs. If you want to succeed in online marketing, you need to move away from interruptive marketing, such as banner ads and start moving towards a more inbound marketing approach.